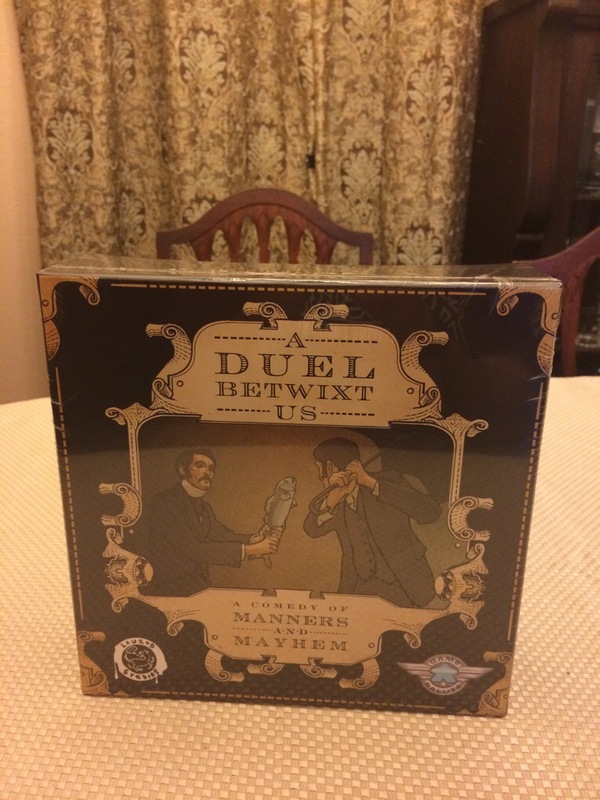 After a rough kickstarter campaign, my copy of A Duel Betwixt Us arrived today. Game Salute stepped in and helped get the production back on track, with regular updates to make sure we knew what was going on. 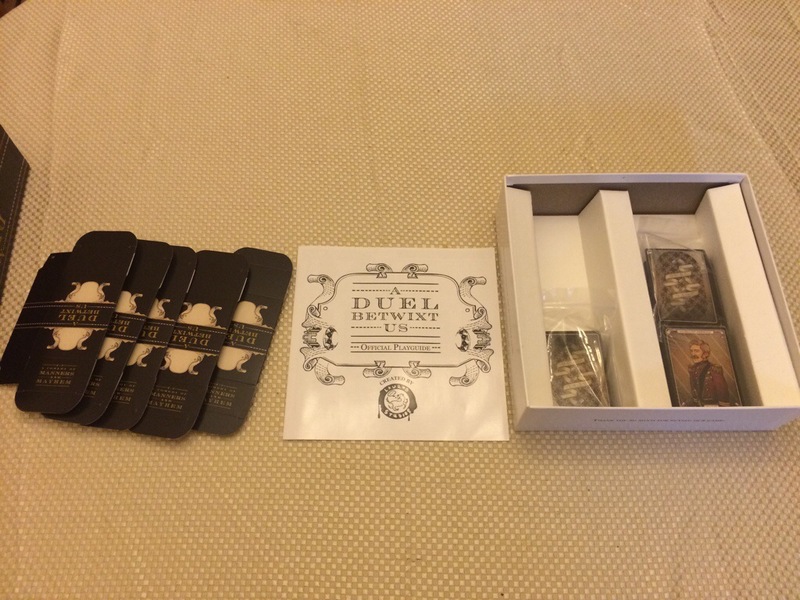 The packaging is very well done, with a large box, bagged and shrink wrapped cards, and pop-up boxes to store the cards in once they’re unbagged. Those boxes are sized so that the cards will fit whether they’re sleeved or not. In A Duel Betwixt Us, you assume the role of a Victorian gentleman (or lady) and attempt to defeat your rival on the field of honor. Reese and I did a read through of the rules and then set up a game to play test it. The rules are pretty simple, with a quick setup and an easy turn based play mode. You draw cards that represent different weapons and armor that you have to build in order to use, as well as ones that represent events (actions that happen to you, your rival, or both of you) or tricks (used to alter the outcome of a duel). You have miners that toil for you, creating the ingots that are used to build your equipment, as well as occasionally fighting for you or being attacked by your rival. And finally, there’s the dueling. There are a number of different duel cards, with different types of duels which each have different rules about which kinds of equipment and other cards can be used. Combat is simple, once a duel has been declared both players declare which equipment they will be using, play any tricks, and then total up the numbers on the items. The winner takes either a favor from their rival or adds two new miners to make them more ingots. When one player has taken all of the favors from the other, the game ends and they win. We had a good time playing it, with a full game taking about an hour to complete including reading the rules and doing the setup. This should be a fast, fun game for parties or other gatherings because even the audience will be amused at the snark in the cards and gameplay.